The publisher gave me PDFs of the final indexes for volumes 1 and 2, and I compared these carefully with the indexes I had written. I wanted to see any changes the publisher had made and refresh my memory of both the subjects I had indexed and their organization. In my indexing software (I use Sky Indexing), I made a copy of each volume’s index and entered the publisher’s edits, and then increased the locator numbers (a locator is a page or a range of pages) by 1000 in volume 1 and by 2000 in volume 2. Thus, for example, page 35 in volume 1 became 1035 and page 35 in volume 2 became 2035. I then merged these into a new file, in which I indexed volume 3. I changed the page numbers to the correct forms with volume numbers as a final step so I would not have to type 3: before every locator for the new items. The real extra work came in creating and organizing subentries. Many entries in volumes 1 and 2 had only a few locators without subentries. When the indexes were combined, these entries had too many locators and I had to make subentries. This required going back into the PDFs for those volumes and rereading those pages. Other entries in a single volume had subentries, but there were so many in the combined index that they became unwieldy. I reworded some subentries to combine them, but more often, I put the subentries into broad categories and split them into nested entries. 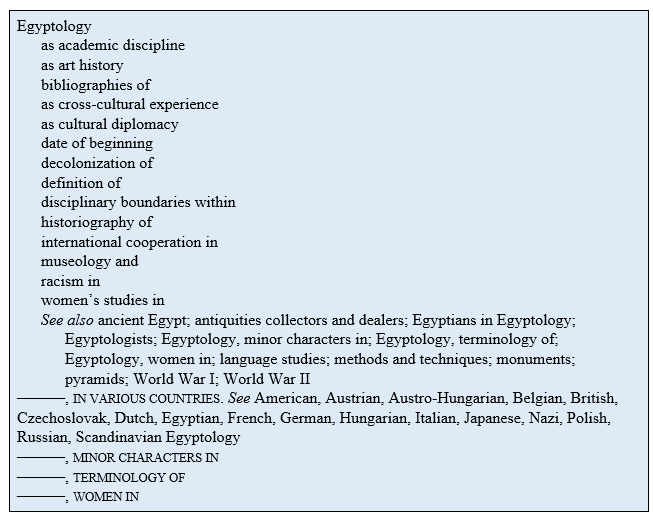 Two of the great names in Egyptology illustrate this editing process. I made some other changes in the combined index. Many of the big names had a subentry “career” or “early career” or “legacy.” These were all force-sorted as the first subentry under the name. Volume 1 discussed many books. I reviewed these entries and removed some from the index that were mentioned with little or no discussion. This was relatively easy to do in the indexing software because I could group all the records that had italics in the main entry. If a book had only one locator, I reread the page in the PDF. Sometimes there was sufficient discussion to keep the title in the index. In addition to these smaller edits, I reorganized some of the large entries. When I was finished with the editing, I changed the locator numbers to volume and correct page number — an easy task in the software. In this situation, I did not know that a combined index would be required in the last volume of the series when I worked on the first two volumes. What if I had a heads-up on another project? What would I do differently in indexing the early volumes? I would create subentries for anything that was likely to appear in the following volumes, even if it did not require subentries in the current volume. When I was finished editing the index with the extraneous subentries, I would suppress them in the current index, saving them for the later combined index. This could be done in one of two ways. I could save the index with a different name, and then in the new one, consume the extraneous subentries, that is, remove the subentries but retain the locators, which my software can easily do. When I made the combined index, I would merge the file with the subentries into the new file. Or I could duplicate each of the entries with extraneous subentries in one file, label them with a color code and filter them out, and then consume the subentries in the unfiltered records. To make the combined index, I would unfilter the records with subentries. Either way, the combined index would still be more work than a single-volume index, and I would charge a higher rate. A combined index is more than the sum of its parts. Be aware of this if you are either of the parties negotiating for such an index. A few years ago, I was asked to index a book about a medieval ruler and the mosque and city he built. The book was primarily an architectural history, but it included substantial information about the city and about the ruler’s childhood in central Asia and its influence on the mosque’s architecture. But I was told that the names of both the ruler and the mosque, and the name of the city, were not to appear in the index. I interpreted this to mean that those names were not to be main entries. There were entries on the other cities in the country discussed, so I put the forbidden city as a subentry under “cities,” and I made entries for “education of X” and “rise to power of X” even though I knew that they ought to be subentries under the name of the not-to-be-named ruler. Being very much a newbie at the time, I asked for a volunteer to peer review my index. My reviewer rightly asked why I had not put main entries for the ruler and the city. When I told her that that was what the editor and author had requested, she suggested that I make a second version of the index with those items properly indexed and give the editor the choice. I did that, but the editor replied that they had decided on the first option. I later saw that in the published version they had also removed the education and rise-to-power entries, as well as the cities main entry so that the “forbidden city” was nowhere to be found in the index, although the other two cities retained their main entries. Why? I have never understood why the client did not want those items in the index when they were so obviously part of what the book was about. Long-time indexers say that they were taught decades ago not to index the main topic of the book — what indexers now call the metatopic. Now, though, whenever we peer-review an index, the metatopic is the first thing we look for. It has been found that when readers use an index, they usually look first for the metatopic that is apparent from the book title or subtitle. If the book is about aardvarks and readers do not find “aardvarks” in the index, they do not conclude that the index is bad; they conclude the book is bad, with nothing about aardvarks. But under the metatopic(s) — there can be more than one — an indexer can put subentries that cannot stand alone as main entries, such as a definition or other items that readers are unlikely to look for in the index, and then add See also cross-references to guide the reader to the entries for the main discussion. Every main entry in the book should relate to the metatopic(s) in some way. Handling the metatopic(s) is not always easy, and indexers have different ways to approach the task. The metatopic(s) may be easy to identify from the title or subtitle, or by reading the introduction and conclusion — which indexers read before beginning the index. On the other hand, in a complex scholarly book, the metatopic may not be readily apparent. An indexer may formulate the metatopic as a sentence or short paragraph before deciding on a concise phrasing suitable for an index entry. As a reader, do you look for the metatopic when you open an index for the first time? Are you disappointed if you do not find it? Have you noticed a difference in indexing styles between older and newer books?